I don’t know when it happened, and at the time I was completely unaware of the first break in my parent’s marriage. But looking back on it now, some thirty years later, I can see a very distinct line in my childhood. On one side there is light, on the other there is a shadow. We lived in a top floor apartment until I was six. I spent a lot of time alone with my mother. I had Billy Joel’s Glass Houses on cassette. My father was a drummer in a band, so I was always surrounded by music. The Beatles, the Doors, Led Zeppelin, I had young parents and was lucky enough to be engulfed in these bands from a young age. But there was something about “You May Be Right,” Billy Joel’s anthem of indignation and unhealthy love that resonated with me at five or six years old. So, I play the song over and over. It’s not long before I discover I can tip the radio speakers to the floor and let my neighbors hear it. My father gives Jennie and me a shower while my mother is out for the night at some aerobics class, (it’s the 80’s). Jennie has a bathing cap and I don’t. As the younger sister, I begin to cry and throw a fit. The bathroom is blue, even the toilet is an aquamarine color. My father finds an old New York Yankee’s batting helmet and puts Band-Aids over the holes. There, he says, now you have a bathing cap too. Later, as he dries us into the fluff of a warm towel he regales us with funny stories about doors and wheels falling off of his car on his drive to work. We laugh so hard we almost shatter. My father’s belly is a mountain. I sprawl out on the peak, feel his breath lift my little body up and down. On a tiny black and white television, The Yankees are playing the Kansas City Royals. The room is covered in shadows. 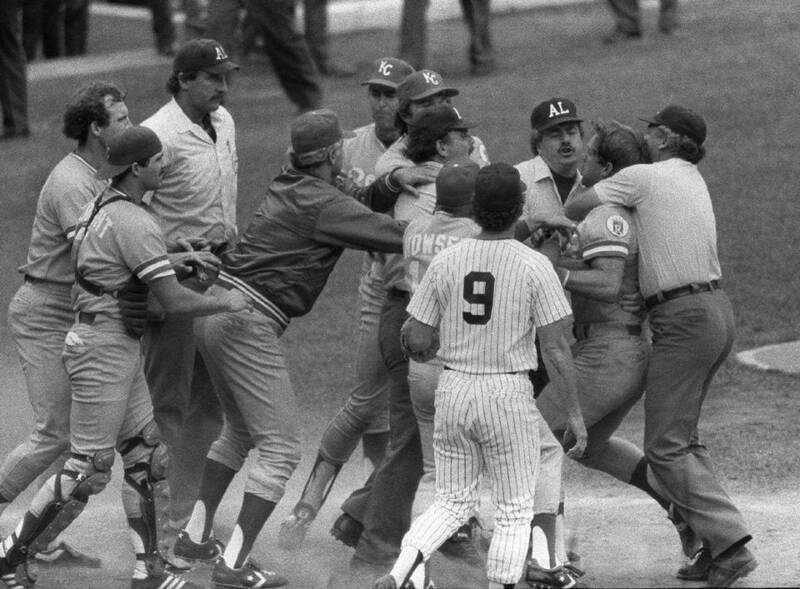 George Brett is ejected from the game because he has used too much pine tar on his bat. My father is whooping and yelling for my mother. I bounce high into the air and fall. Some nights the Yankees lose. Other nights, the Yankees win. Reggie Jackson is my favorite player. The world around us is pinstriped and perfect. We come home from a camping trip to find our television has been hit by lightning. My father places the small black and white on top of our mahogany console. Jennie and I sprawl out on our shag rug and spend two hours watching Little House on the Prairie. I fall asleep against the propped elbows of my sister.